For Christian Schwarz, the natural world is like oxygen. He breathes in its wonders and can't imagine life without it. Schwarz is fascinated by every living thing around him, from mushrooms and moths to majestic redwoods. And he is acutely aware of how precarious it all is: Climate change and human sprawl loom large in his consciousness. But the plight of the planet doesn't leave him feeling defeated. Instead, it spurs him to action. With the infectious enthusiasm of one who has found his calling in life, Schwarz is empowering "citizen scientists" to document today's biodiversity in hopes of inspiring action before it's too late. It's easy, it's fun, and everyone can do it, says Schwarz, demonstrating the process by grabbing his smart phone, snapping a photo of a redwood tree, and uploading it to a public database with an app that identifies the species, time, and location—all in less than 30 seconds. Using apps like iNaturalist, citizen scientists around the globe are creating thousands of records per day, each of which contains three simple pieces of information: an organism, a date, and a place. Collectively, the result is a "huge, dynamic book about the living world and how it's evolving." "The great thing about citizen science is that it's less about what you know and more about how well you can share," said Schwarz (Stevenson '17; ecology and evolutionary biology). "You can be a dog walker who knows nothing about nature, but still make serious contributions to our understanding of climate change. Dog walkers are great because they're outside all the time." Sitting on campus surrounded by redwoods, Schwarz acknowledged that it "may not seem important to document this redwood today, but 100 years from now, they may have died out in this part of the world because of climate change." "Time is much bigger than we are, and organisms are moving through space and time," he added. "Only by sharing this information do we have a chance of understanding it in real time." And people are heeding the call. iNaturalist was created by a group of UC Berkeley graduate students in 2008, and its use has exploded in recent years. Partnerships with the California Academy of Sciences and National Geographic ensure that growth will continue, which delights Schwarz, whose passion for the natural world took off at UCSC. At 29, Schwarz has already co-authored Mushrooms of the Redwood Coast, a comprehensive 600-page guide to the fungi of Coastal Northern California. Based on years of observation and collecting, the book was a labor of love for Schwarz and coauthor Noah Siegel. "We realized if we wanted a modern and in-depth field guide, we were going to have to write it ourselves," said Schwarz, who was barely out of his teens when they began the project. Today, Schwarz lectures about mushrooms all over the country and has amassed thousands of field journal entries, photographs, and specimens of dried fungi, which he donated to the Ken Norris Center for Natural History at UCSC. He and Siegel, as well as new co-author Thea Chesney, are hard at work on a book about mushrooms of the Sierra Nevada. Ironically, as a kid, Schwarz thought mushrooms were "the most boring thing imaginable." His brother, inspired by a passage in Lord of the Rings, asked for a field guide for Christmas, which Schwarz thought was ridiculous. "But it was a really rainy winter, and there were mushrooms everywhere, and it's like a switch flipped," he said. "I never looked back." 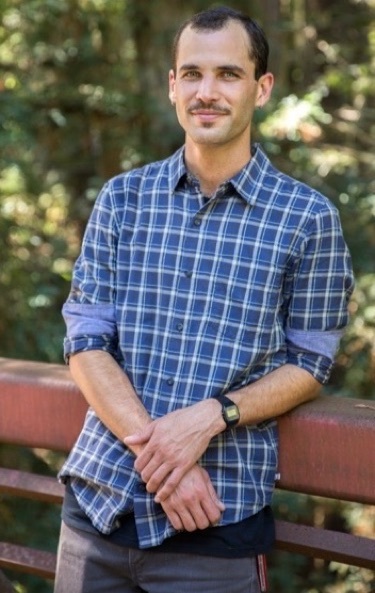 When it came time to apply to college, he chose UCSC for its location among the redwoods. "I wanted to go into the woods between classes," he said. And that's exactly what he did. One day, Schwarz spied a cluster of purple mushrooms among the redwood needles behind the Engineering 2 building on upper campus. It turned out to be a new species—and only the second sighting of the genus in California. Today it's known as Pseudobaeospora deckeri—named after Schwarz's high school teacher, Lee Decker. "I always told him if I ever discovered anything, I'd name it after him," said Schwarz. As a child, Schwarz loved exploring tide pools, but he was pretty singleminded about fungi until a fateful trip to Borneo. His first night in the hostel, he stepped outside only to discover thousands and thousands of moths covering the walls, attracted to the porch light. Mesmerized by the colors, patterns, and variety, he spent the next three days photographing moths. "Once the bubble burst, I started paying attention to everything," he said. Now he shares his zeal with everyone he encounters. A Marin County teacher recently invited him to teach a weeklong class on fungi, which began with a Monday hike to gather specimens, followed by a simple DNA extraction. "My co-instructor Damon Tighe took the samples to San Francisco for analysis, and we got the sequences on Friday," recalled Schwarz. The students posted the results on iNaturalist, including a couple of sequences that were the first for those fungi. "They were so stoked!" said Schwarz, who delights in how easy social media has made it for anyone—from a child to an academic—to contribute to the hyper-collaborative book that's being written about the natural world. "I don't think I'd be interested in organisms nearly as much if I didn't have someone to tell about it." With a $15,000 grant from the Santa Cruz Fungus Federation, Schwarz is sequencing the DNA of 650 mushroom specimens. The result is one of the most deeply documented open-source repositories of fungal DNA in North America, according to Schwarz, who fields requests from researchers who need specimens for further analysis. Still, the repository only scratches the surface of Schwarz's collection of thousands of specimens, housed in the Norris Center. Some might call what Schwarz does "glorified stamp collecting," but he sees his work as foundational, because it gives researchers the tools they need to ask "more interesting" questions about ecology and evolutionary history. There is one area of research Schwarz wants to pursue himself, however, and that is monitoring how the life cycles of animals and plants change in response to variation in climate. Consider, he says, the annual spring wildflower bloom, the insects that hatch during the bloom, and the migrating birds that feast on caterpillars and other critters. "If there's a mismatch in timing, it can be devastating—no insects to pollinate the wildflowers… or no food for the birds," said Schwarz. By integrating the age-old skill of observation with 21st century technological innovation, Schwarz is modeling a new way of learning and communicating about nature—and perhaps the future of conservation, as well.